Yay - it's over! 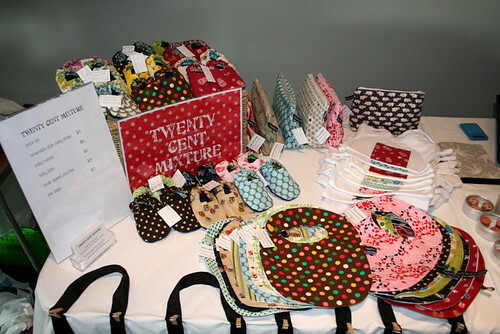 I had a great time at Craft2.0 on Saturday. Because of the sunny weather there were less people through than at some of the earlier fairs, but I still managed to sell quite a bit of stuff. I do have about half of it left over though (I wanted to have too much rather than not enough), so once I get time to photograph it, the online shop will be opening. Late nights beforehand meant I was in serious need of caffiene at set-up time, but I brought my crafty helper-fairy (Alex) along to help me and sent him off in search of coffee while I set up my stall. I had a dream the night before that I didn't sell anything all day, but my first sale of a bib, shoes and a tshirt made me feel much better! Great meeting you & seeing all your lovely creations in real life. Pity I don't have small people in my house anymore. Oh dear on the dodgy noises...hope it's not too spendie to fix. Cute stall : ) Hope your sewing machine pulls through! Mine has been giving me hints as well that it might be time for a check up. Looking forward to seeing your Etsy shop. LOL your poor machine, it's been rather busy lately! Glad your first stall went well, but they are exhausting aren't they? So did you sell those tasty olive slippers? Now that I've seen the picture, I'm kind of lusting over those brown ones with the coloured dots. they look like m&ms. i saw all your beautiful stuff at the fair :) Beautiful! !